Rebecca is a self employed Accredited Exercise Physiologist and she works closely The Healthy Body Company team to support us to achieve great outcomes for our clients. Rebecca entered the fitness industry 10 years ago as a personal trainer. At 24 years of age purchased her first gym franchise learning the ins and outs of running a business. Personal training qualifications were just not enough to ensure credibility as a fitness professional, so Rebecca pursued a university degree at Western Sydney and graduated as an Exercise Sport Scientist and carried on studies at Charles Sturt University completing a master’s degree in clinical Exercise Physiology. As an allied health professional Rebecca invests continually in professional development through ESSA to ensure the ability to manage a wide diverse range of clients. Rebecca is also a registered NDIS provider, level 1 sports trainer and a Crossfit Level 1. 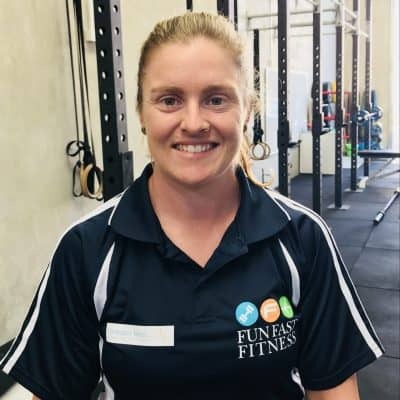 Rebecca currently operates an independent functional training facility called Fun Fast Fitness in the Hawkesbury region offering a variety of exercise services to males, females and teenagers. In 2018 Greater West Exercise Physiology was established to provide Exercise Physiology services to the Western Sydney region. Rebecca is an accomplished athlete having played at National levels in both Futsal and touch football. Currently Rebecca participates in Crossfit and plays club level Touch Football at Penrith. Rebecca is a member of Exercise Sports Science Australia.